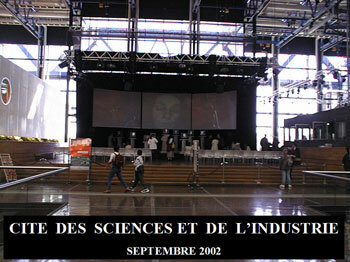 This experimental opera was presented on the occasion of the festival " Villette Numérique " in September, 2002, Paris. It gathered three real singers and twelve virtual ones, on the theme of Pygmalion in love of a virtual Galatée. 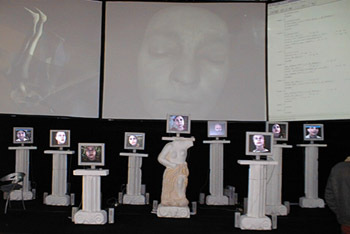 In spite of some technical adventures in the first performance, and a mismanagement of our virtual choir (among others a global sound which had nothing to do with the individual sounds of every element), the computers have finished to fit nevertheless rather naturally into the scene, acquiring little by little their dimension of actors, a certain life coming from their real-time piloting by an off-camera conductor.